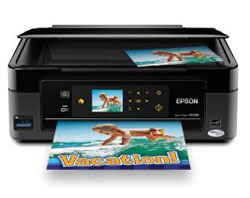 Printer Comparison has tested a so called Small-in-One printer from Epson. The inkjet printer is called Epson Stylus NX430 and has a pretty small footprint, but does it produce prints of good quality? Printer Comparison ends up giving the NX430 an overall score of 3 out of 5 possible points. This wireless printer gets praise from the reviewer on aspects such as small size, low price tag and it is energy efficient. There are a few negative sides keeping the Epson printer from getting a better score including high ink costs and scanning can be a bit difficult. Read the full review of the Epson Stylus NX430 color inkjet wireless printer here.